The average American owns around six cars throughout the course of their lifetime, but sometimes there’s that one car that really stands out. Perhaps it’s a car you’ve dreamed about since you were a child, or maybe you saw it somewhere and you just knew it was “the one.” Whatever the case, those cars are special and tend to stay with you even if it isn’t in your garage. That’s what happened to Clem Clement – and this is his story. It was springtime in Hoboken, New Jersey; the year, 1956. Clement, then a teenager, spotted a dilapidated, old 1940 Mercury Convertible Sedan parked on side street. It was in pretty bad shape; painter’s canvas had replaced the top. However, where others saw a hunk of junk, Clement saw a beautiful promise. Despite the fact that he had no money – and no job – Clement decided that he needed to buy that car. He left a note on the vehicle’s windshield, which included his offer, and went on his way. He did not really expect a response, but two weeks later, the call came. The owner accepted Clement’s offer of $25 and as soon as he paid it, the car would be his. Somehow, the teen managed to scrape together the money and he proudly made his way back to that side street to claim his new car – which, incidentally, didn’t run. Seems the clutch and transmission were shot, but Clement didn’t let that stand in his way. He brought his dad on board to help him get the Mercury home. While his mom was not exactly thrilled with the project, his dad was all in. They worked together on the car, replacing the tattered front bench seat and installing an underseat heater. Many of the parts came from the salvage yard and not all fit perfectly, but little by little it came together. Clement cut a hole in the back part of the front bench seat to accommodate a radio speaker. He also had to replace the hood after the original one flipped up and bent over the frame of the windshield after coming unlatched while the car was in motion. Clement’s father’s untimely death brought with it a strain on the family’s finances. In order to help his family, Clement sold his beloved Mercury to his cousin – for the now bargain price of $25 – the exact amount he originally paid for it. As the years passed, Clement lost track of the car. He thought it was lost forever. Time marched on. College, twenty years in the military, Clement’s life kept right on moving, but he never forgot that first love with the painter’s canvas top. He began to search for the car, in the off chance that it was still around, but each lead came back a dead end. In a last-ditch effort to locate the car, Clement wrote to a publication that specialized in antique cars. He just wanted to know what had become of his Mercury. He didn’t expect much, but one day the phone rang. On the other end was Bob Aufderheide from Ohio. He thought he just might have Clement’s car. He asked Clement if the car had any unusual characteristics. Clement told him about the hole in the seat for the speaker and Aufderheide confirmed that he was, indeed, in possession of Clement’s Mercury. The car had an interesting history, changing hands several times, traveling from New Jersey to Pennsylvania, and finally Ohio. Aufderheide had left the car parked in a garage for 26 years, then had it restored in 1997. 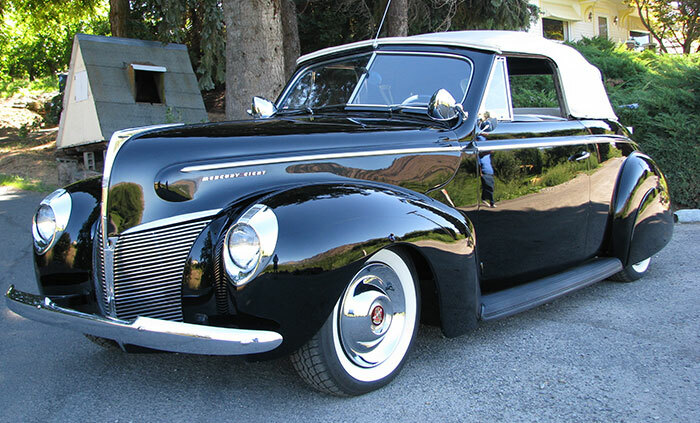 Seems the ’40 Mercury was not just a beautiful car that caught an ambitious teenager’s eye, it is one of less than 1,000 such cars manufactured by the carmaker. When Aufderheide passed away, the family reached out to Clement so he could bring his Mercury home. They knew he would be the best one to care for the car and he was not about to say no. So, that is how a battered and bruised 1940 Mercury found a home, went on a journey, was fully restored, and returned to the man who loved it. There is nothing like finding the car of your dreams and being able to bring it home. At Woodside Credit, we want to be a part of your dream car story. Visit our site and complete a Quick Quote to find out how easy it is to put that dream car in your own garage.